CloverEats: Jeera Thai in New Haven | Clover Eats! We walked by Jeera Thai a few times before, and finally decided to try it one day. It’s right across from a parking garage and only a couple minutes’ walk from our place. 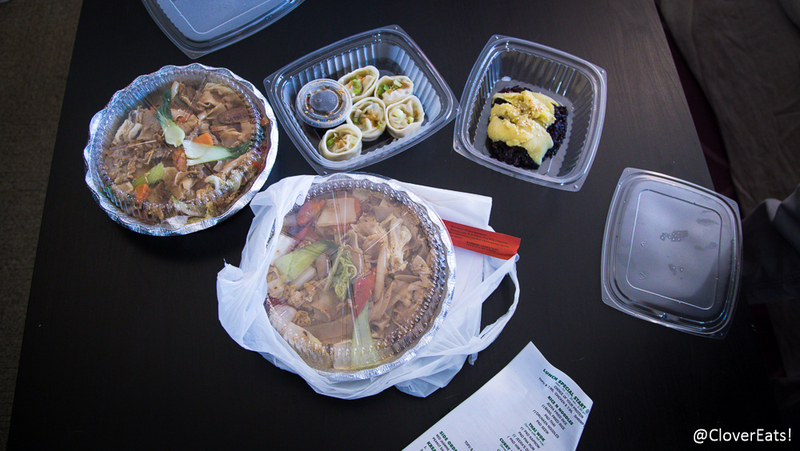 We liked it so much we ordered takeout from them several times in the next few days. It’s a really small space, with only a few tables and seats available. On nicer days, they expand onto the sidewalk, which almost doubles their capacity. I really like how the wall pattern extends into the doors, which have a cut-out appearance. It’s also really well decorated. There’s usually only a few people working, one lady in the front, one guy in the back. Because it’s so small, they are often out of a specific dish or haven’t prepared it yet for the day. We’ve missed out on mock duck, roti canai, yam custard, etc. on many occasions. Luckily, the staff is quick to offer other options, and everything is pretty tasty. They call themselves the “Thai Health Kitchen” – and I do think it’s less greasy than other Thai food I’ve had. Still probably not the healthiest meal you could eat, but certainly the tastiest, and they’re generous with the portions! Roti Canai – Southern Thai-style crepe with yellow curry dipping sauce. This was a fantastic little appetizer; the ‘crepe’ is similar to the Chinese flatbread or Indian roti, but thinner and fluffier. The curry sauce was on point. Green Emerald Dumpling – steamed vegetable dumpling with vinegar and roasted sesame dipping sauce. I’m not sure what was in the sauce for this – it had a hint of sweetness, almost as if there were brown sugar in it, but it was amazing. The dumplings themselves were good, but the sauce was the true star of this appetizer. I got this with duck the first time, not having ever tried Drunken Noodles with duck, and have discovered my new favorite pairing. Somehow, the noodles became imbued with the essence of duck, and the flavors just matched really well. I didn’t like the mock duck as much, it was a little too tofu-y. I’m never going back to the days of chicken with my noodles. A solid curry, and the purple rice is a nice healthy touch. Always a winner in my book. There was one time when we got takeout from them and one of the noodle dishes was waaaaay too spicy, but every other experience has been good!